San Francisco was once voted one of the most walkable cities in the country by Walk Score (number 2 on the list in 2013 behind only New York City). Walk Score looked at factors like the number of pedestrians who hit the streets, the design of the streets themselves, the number of parks and public spaces, the planning of neighborhoods, and the distance of the average commute to work and school. But we San Franciscans don’t need data mining to know that our city is prime turf for pedestrians. We hit the streets in the thousands every day and make smart use of our time in a city that’s becoming more and more car-oriented every year. Enjoying the great year-round temperature and fresh sea air is something that’s essential to life in San Francisco. Not to mention that almost anything you could ever want can be had within walking distance. San Francisco is also one of the most dangerous urban areas for pedestrians in the United States. In fact, it came in second (behind the Big Apple again) for the number of automobile-related pedestrian injuries and deaths in 2014. In a city where almost 4% of individuals walk to work it’s shocking to learn that nearly 800 people were struck by automobiles while on foot last year alone. 21 of them were killed in these vehicle crimes—that’s the highest pedestrian death toll since 2007. 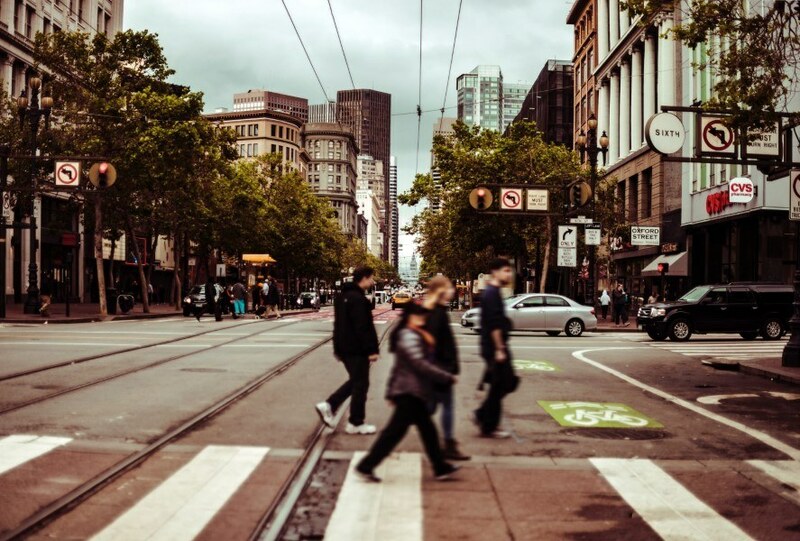 I am seeing more and more serious pedestrian injuries in my work as a San Francisco personal injury accident attorney who focuses on pedestrian accident cases in the City. Pedestrian deaths now represent a full 50% of all traffic related fatalities in San Francisco. What’s perhaps even more shocking is that just 65% of drivers who cause fatal pedestrian crashes in San Francisco are ever prosecuted. In fact, the vast majority of these traffic crimes in the city are never investigated by the SFPD beyond the initial reporting. Combine these two facts and you find that the vast majority of drivers who kill or injure pedestrians on San Francisco streets are never held responsible for their actions. This disparity has created a culture of neglect here in the city. While we’re all pedestrians at some point in our daily lives, individuals on foot have somehow been deemed less important than individuals behind the wheel. This auto-centric view of life in the city can only make things worse by decreasing the safe walkable spaces, increasing the number of accidents and virtually eliminating the consequences for at-fault drivers. Below are several things you can do to protect yourself on San Francisco streets. Plan your walk to avoid these areas altogether and you eliminate that risk entirely. If you can’t do that, be extra vigilant when passing through. Don’t let distractions take your mind from the road and always be aware of what’s around you. Most pedestrian related vehicle crimes occur at dusk or later when visibility becomes a key contributing factor. It’s your responsibility as a pedestrian to ensure that drivers can see you. Wear bright clothing, use flashlights or blinking strobes, stay in well-lighted areas, and avoid crossing the street in dark spots. Lastly, never assume that a driver can or does see you. I always make eye-contact with the driver before stepping off the curb. It is the only way I can be sure they see me. The use of cellphones and other digital devices (like music players) has become a significant contributing factor in pedestrian crashes in San Francisco. It’s estimated that these devices directly contribute to at least 35% of such collisions. It’s up to you to remain focused and treat the cars around you with the proper respect (and fear) that they deserve. Use your senses to stay safe: keep your eyes on the road and keep at least one ear free. As a San Francisco pedestrian accident lawyer, I see several cases where the driver or the pedestrian was distracted and not paying attention to their surroundings. However, as a pedestrian, you can’t afford to wait for these changes to take effect. Nor can you change the habits of the drivers around you. You can only take responsibility for your own actions and do what you can to stay safe. If you need a top-notch San Francisco injury lawyer, contact us for a free case evaluation.